I’m so delighted that I was given the opportunity to have a little chat with my new finding author: Miss Alison McQueen. I’ve read her recent work, Under The Jeweled Sky, and I was so drawn to the beautiful story. I’ll get to that later. 1 – Can you tell us what the inspiration was for your new novel, “Under The Jeweled Sky”? 2 – Can you tell us a bit about your writing process –i.e., are you a planner or do you just dive into the story? I don’t have a particular plan except to wear holes in the carpets while I pace around for months thinking about the story. My house is filled with interruptions and life constantly gets in the way. As with all working mothers, it’s an ever-changing balancing act, juggling a family. 3 – Are you planning to write a sequel to the novel “Under the Jeweled Sky”? Right now I’m not planning a sequel to Under The Jeweled Sky. I am currently working on another novel set partially in India and touching upon a subject that remains one of the last taboos. The draft is still at an early stage which means that my house is awash with scraps of paper and cryptic messages that I will have no hope of understanding when they eventually surface. Creating a first draft is utter torture. 4 – When you’re writing, do you use any celebrities or people you know as visual inspiration for the characters? If so, have you got any examples?! Now that you mention it, I realize that I never carry a presumption about who my characters will be. I rarely know in advance what they look like or how they will behave. Sometimes a character will come crashing in fully formed. Others are far more coy and will keep you waiting a long time before they decide to show their true colors. I need to know my characters inside out, but you can’t rush a deep relationship. They always surprise me, even the ones who remind me of people I know. I don’t model my characters consciously at all, they just sort of turn up on the doorstep and ring the bell. 5 – What is your favourite book of all time and why? That is such a cruel question. If I had to choose just one novel, I think it would be Daphne du Maurier’s wonderful Rebecca. I re-read it every few years because I just love it. 6 – What is your average writing day like? Before anything, coffee. I can’t function without my morning hit. After that, the day will disappear. When I am in the thick of the writing process I completely lose track of time. Seasons come and go unnoticed and my husband drops hints like “I might as well be living on my own”. I write in my bedroom which has a lovely view of the garden. In the summer months, I sit at the desk with the windows wide open to let in the bird song. In winter, I drag everything I need into bed which feels fabulously bohemian but causes havoc with one’s back. The house degenerates into a terrible mess, no food in the fridge, no sign of the woman in the attic. By the time I emerge everyone looks a little older. 7 – Your characters are very three dimensional, real women. Do you take inspiration from people you already know? I was born in London during the swinging sixties when mixed marriages were still a rarity. My mother was born in Assam in 1928. She came to England thirty years later, never meaning to stay, and met my father, a strapping great Viking of a man. He was a wonderful jazz musician with a great many peculiar friends. Ours was a strange family without extension. I knew that I had a grandfather and that he had a farm in Africa, but I never met him. He existed only as a single photograph in my mother’s album. My father was effectively an orphan, abandoned to a Barnardo’s home at the age of five. With so little information about who I was and where my family came from, it’s little wonder I became a writer. My unusual parentage and odd upbringing no doubt influences my writing. I am the product of two mismatched people from wildly different cultures, and I have seen from the inside what that can do to a family. 8 – How was your journey to getting published? I have always written, ever since I was a kid. My mother still has some of the notebooks I filled with drivel during elementary school. I worked as an advertising copywriter for many years and my first novel was picked up by a popular TV show over here in the UK. It was a completely unexpected turn of events. I had always planned to start writing novels seriously a little later in life once my children were grown, but the opportunity stood in front of me ten years early. Even now it all seems quite unreal. See you tomorrow for the review of Under the Jeweled Sky. 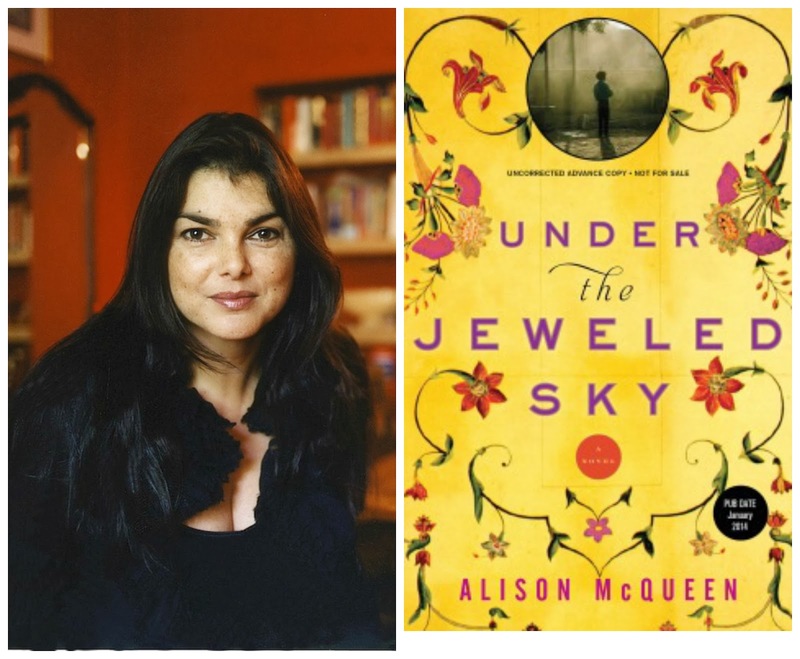 Posted on January 26, 2014, in Uncategorized and tagged Alison McQueen, book tour, Meet the Author. Bookmark the permalink. 1 Comment.